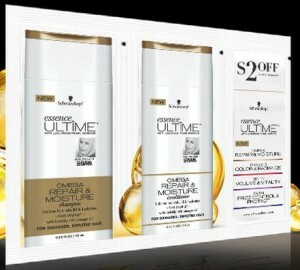 Free Schwarzkopf Omega Repair & Moisture Shampoo & Conditioner!! The first 100,000 people to fill out the short form HERE will get a FREE sample of the new Schwarzkopf Essense ULTIME repair and moisture shampoo & conditioner along with a $2 off coupon for your next purchase. Please allow 1-2 weeks for delivery.